In late August Associate Professors Conor Carville and Mark Nixon staged a major exhibition of manuscripts and other materials for the Happy Days International Beckett Festival in Enniskillen, Northern Ireland. The Festival is a five-day celebration of the Nobel Prize-winning writer’s work, with over 100 events taking place in a wide range of venues. Its organisers asked Reading University to get involved as we have the most important collection of Beckett’s manuscripts in the world. ‘Was I sleeping while the others suffered? : Witnessing the Twentieth Century’ examined the politics of Beckett’s work, tracing the way that the momentous historical events he experienced make their mark on his plays, prose and poetry. 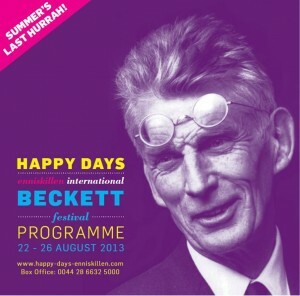 Beckett lived through the Irish Civil War, travelled in Fascist Germany and was active in the French resistance during the Second World War and the exhibition included hand-written drafts of work like ‘Catastrophe’, the play that Beckett wrote for the Czech playwright Vaclav Havel while the latter was in prison as a political dissident. Other exhibits included footage of Susan Sontag’s production of Waiting for Godot in siege conditions in Sarajevo during the Bosnian war and Paul Chan’s version of the same play on the flooded streets of New Orleans in the immediate aftermath of Hurricane Katrina. We are happy to say that the exhibition was a great success, with a steady stream of visitors, many of whom proclaimed it one of the highlights of the whole festival. This entry was posted in Department of English Literature news and events and tagged Department of English, Department of English Literature, Dr Conor Carville, Dr Mark Nixon, English Department, English Literature, Happy Days International Beckett Festival, Reading, University of Reading. Bookmark the permalink.